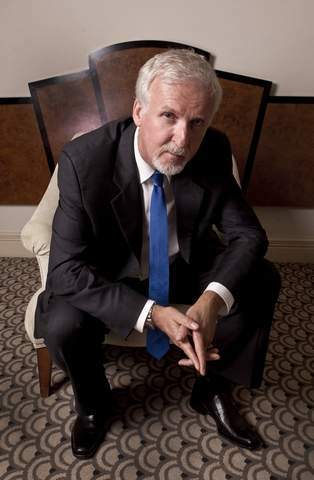 LOS ANGELES — There was a time when James Cameron's career looked as though it might join Titanic, down in the lower depths. Before he became king of the modern blockbuster with "Titanic" and "Avatar," Cameron teetered on an abyss as his romance set aboard the doomed ocean liner ran into production delays, cost overruns and smug talk in Hollywood that the director was out of control and going down with his extravagantly expensive $200 million shipwreck. Fifteen years, 11 Academy Awards and $1.84 billion at the worldwide box office later, Cameron is re-launching "Titanic" in a 3-D version whose new earnings will close the gap on the film that eventually surpassed it as contemporary Hollywood's top-grossing flick. That would be Cameron's sci-fi epic "Avatar," with $2.8 billion. Fresh from his record-setting seven-mile solo ocean dive in the Mariana Trench, done while on a break from writing his two "Avatar" sequels, Cameron continues to ride a wave of success no one foresaw amid the gloomy predictions of 1997, when "Titanic" was bumped from summer to Christmas release because of production problems. "We were the biggest idiots in Hollywood, and they already had us tried and sentenced and hung from the lamppost in the town square before they'd ever seen a foot of the film," Cameron said. "Ultimately, it proved to be a good film, and they all had to eat their words or just kind of shut up and pretend they hadn't said them. That kind of thing puts a lot of pressure on you as a filmmaker, and I interpreted it as just the pressure to be good and to make the best movie that we could. "That's when we moved out of summer and decided, screw it, if we're going to lose a lot of money, let's at least make a good film and not compromise, not try to rush it into theaters." Once the film opened, with solid though unremarkable revenue and reviews praising its spectacular re-creation of the ship's sinking, Cameron hoped it would stay afloat through January and maybe February so that it would have a chance to break even. It wound up making back its money many times over, remained the No. 1 domestic box-office draw for a record 15-straight weekends through the end of March, and picked up the best picture and director prizes among its Oscar trophies. Girls went to see it again and again, pining over heartthrob Leonardo DiCaprio, who became an overnight superstar along with Kate Winslet for their shipboard romance. Many critics found the love story sappy, but no one could deny that Cameron had made a spectacle for the ages, one that might have failed if not for the director's notoriously demanding standards. Water shoots are among the toughest on actors and crew, yet Cameron was undeterred, even after a difficult time with his previous ocean adventure, 1989's "The Abyss." "Yes, it was hard, but no one ever said it was going to be easy," Winslet said. "When all the stories started emerging about how tough it had been and Jim Cameron being mean to everybody and costs over-running, I went, wait a minute, what makes these people think they can speculate about all of this? They weren't there. "Yes, he lost his temper, but he only ever lost his temper for really, really good reasons. Like we would spend days literally setting up a shot, and if someone isn't doing his job and dumps water ten seconds too late, then we've got to start over. ... Yeah, I could understand that man getting a little (ticked) off." Cameron's photo-realistic computer effects on "Titanic" helped propel Hollywood into the digital age, and he continued his innovations with the underwater 3-D documentaries "Ghosts of the Abyss" and "Aliens of the Deep." It took 12 years for his next dramatic feature to hit theaters, the sci-fi sensation "Avatar," whose success turned the new novelty of digital 3-D into a frenzy for Hollywood. Studios hurtled into 3-D action shoots or, to the dismay of fans and critics, did hasty, ugly 3-D conversions of 2-D movies that gave the format a bad rap. As "Avatar" set the standard for movies shot in 3-D, "Titanic" may raise the bar for movies converted from 2-D. Distributors 20th Century Fox and Paramount spent $18 million on the conversion and digital remastering, with Cameron overseeing a team of 300 people who spent 60 weeks on a frame-by-frame reconstruction to add the illusion of depth. The results are dazzling, the images of the shipwreck now presented as though the audience is right there watching alongside. Cameron had thought about a 3-D "Titanic" for the past decade and eventually settled on April's centennial of the 1912 shipwreck as the ideal time to re-release the film. It opens April 4, in advance of the April 14 anniversary. In 2005, Cameron already was showing 3-D footage of the film to theater owners at a convention, where he and "Star Wars" creator George Lucas were among filmmakers pitching the notion of converting older movies. "'Titanic's' a no-brainer," Cameron said. "It's a timeless film, it's visually sumptuous, it was shot in a way that's very conducive to 3-D. I've always been trying to do 3-D in a way, by moving the camera, by shooting with shorter lenses so you get deeper focus and you're more aware of the background. All these ways that you enhance it, even when you're shooting in 2-D. So the 3-D conversion actually brought all that out." Hollywood became sold on the idea once millions of fans started shelling out a few extra dollars to see new blockbusters in 3-D. So far, a handful of older films have come out in digital 3-D versions, among them "The Lion King," which pulled in $94.2 million to raise its lifetime domestic haul to $423.2 million and Lucas' "Star Wars: Episode I — The Phantom Menace," which added $43.1 million to lift its total to $474.2 million. "Titanic" never played or barely showed in some big markets such as Russia and China, and fans now in their teens have only had a chance to see it on small screens, Cameron said. That gives it a good prospect to narrow some of the billion-dollar gap between its worldwide gross and that of "Avatar." "The goal here is not about making money with 'Titanic.' The goal is to put the film back into cinemas so that people that either loved it back then and haven't had a chance to see it in a movie theater since can go see it. Or people who only know it from video can see it for the first time on a theater screen. I don't make movies for iPhones or tablets. I like to think that there's still a sanctity in the cinema experience."